Mason jars have a special place in our hearts. Growing up, we both remember our grandparents using these rustic jars a million different ways. Tinsley’s grandparents had a huge garden and would spend most of the early fall canning the “fruits” of their labor into mason jars of all sizes. Jason’s grandparents grew grapes and harvested them into the large mason jars to make the best sugary-sweet grape juice you could ever have. Mason jars have now become a hot ticket item. People are flocking to local unique stores to get their hands on those baby blue antique jars. Stores like Target, West Elm and Pottery Barn have been designing “new” mason jars to appeal to a million different decorating ideas. Jason and I were lucky enough to have a ton of mason jars passed on to us from our grandparents. They must have known that we would become serious foodies one day. We’ve been using them for flower vases, as storage for dry ingredients and as decoration. We’ve even used them to display unique buttons and sea shells. Recently, we have attended a lot of weddings. 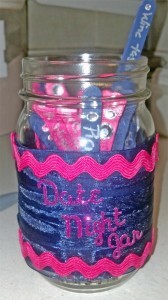 Tinsley came up with a unique idea to turn some of the small mason jars into unique date night jars for the bride and groom. 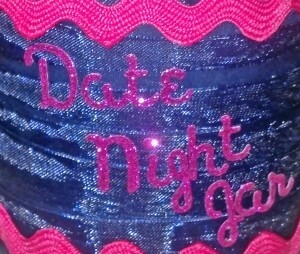 Tinsley used the bride and groom’s wedding colors as a theme for the jars. 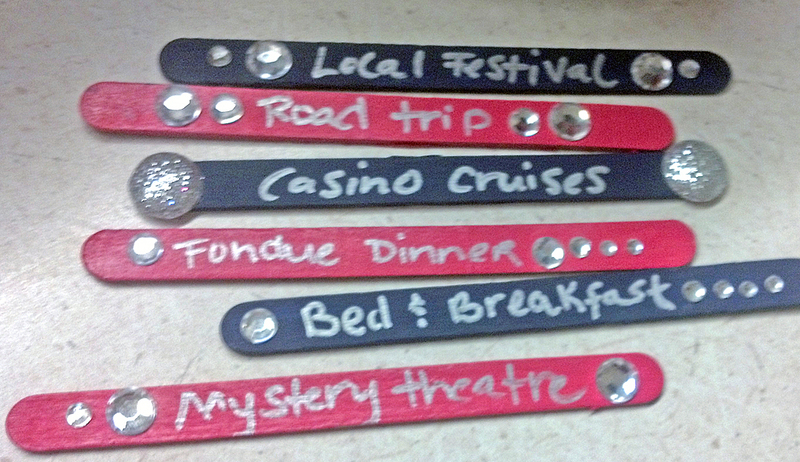 First, the sticks were painted, using two colors. Paint half of the sticks (10-15) with one color and the other half with the other color. 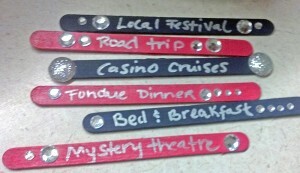 Once dry, we came up with 20-30 date night ideas for the happy couple and wrote one on each stick with a color sharpie. We embellished each stick with some of the diamond and pearl stickers. 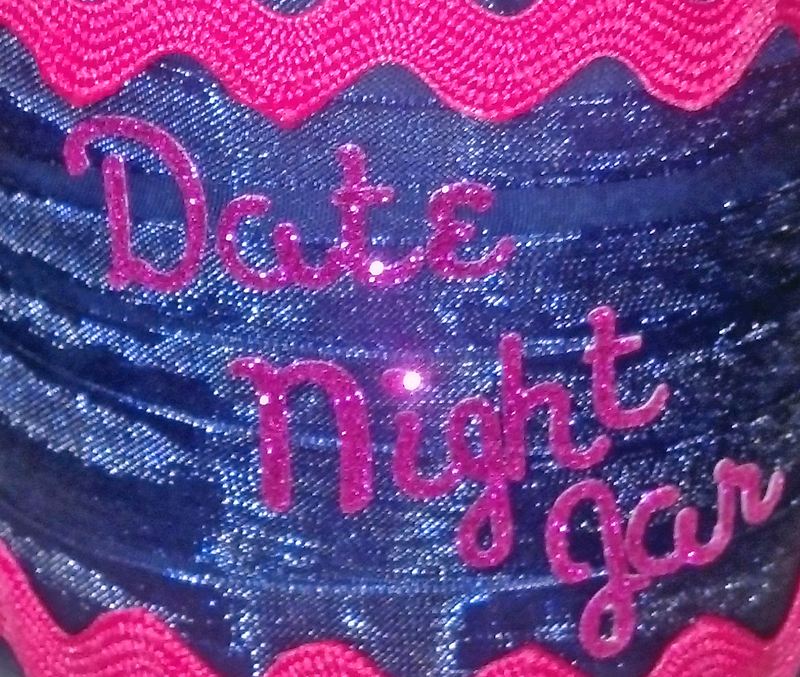 We also decorated the jar with card stock and ribbon and finished with a direction card and labeled the jar as “Date Night Jar”. We are so excited of how adorable they turned out. The jars are simple, rustic and elegant. 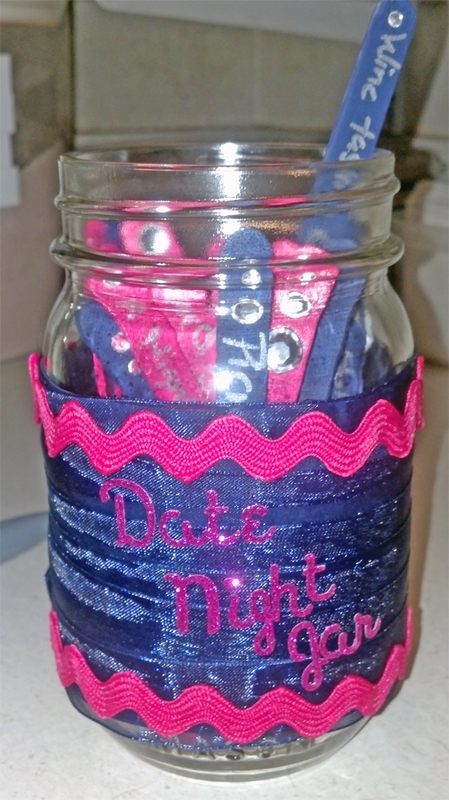 Have some leftover jars and an upcoming wedding? Try this idea! The bride *and groom* will love it.